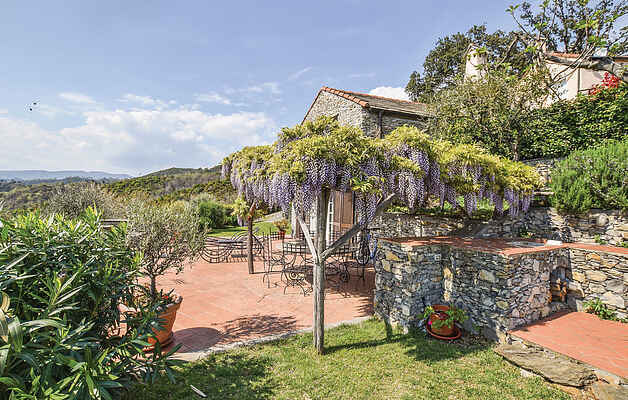 Immersed in the typical Ligurian vegetation and surrounded by olive trees, rosemary bushes and mulberry trees, elegant accommodation with an enchanting panorama dominating the entire coast with a beautiful shared bio - swimming pool (shared with the owners of a nearby villa). It is located a few kilometers from the Riviera dei Fiori and 2 km from the sea. Countless attractions in the area: for bike enthusiasts, different routes that will take you to the Ligurian hills and for golf lovers only 12 km away a sports club. 42 km Pietra Ligure became famous in the European panorama for organized sports competitions. In the immediate surroundings: Noli and Spotorno and Borgio Verezzi recognized as one of the most beautiful historic towns in Italy. Genoa, "La Superba" is 45 km with its history, its alleys and the largest aquarium in Europe. And from here, you can take the boat to visit the enchanting scenery of "Cinque Terre". And finally, less than 30 km from Genoa, the enchanted corners of the coast with the renowned Santa Margherita and the incomparable Portofino. Dirt access road (2 km).